« Passions Are Easy To Lose Sight Of And Detrimental If Lost. Recently, I was watching a hockey game with twitter on (you aren’t watching alone if you’re on twitter….right?) I noticed that while Doc Emrick was still discussing the cross ice pass to set up the goal, a GIF of it popped up in my TL. It perfectly captured the play from beginning to goal just seconds after it happened. The snippet didn’t come from a team’s account or a media outlet, it came from @myregularface sitting in her New Hampshire home office. Stephanie Vail is the talented woman behind the amazing GIF machine that is @myregularface. She cranks out GIFs ( looped video clips of events in Graphics Interchange Format ) from as many as 6 games at one time. Hockey Chick: What motivated you to do this? Why go beyond your Bruins? 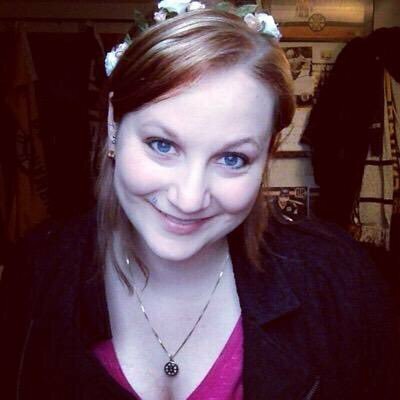 Stephanie Vail: I was motivated to make hockey GIFs because at the time, I was covering the AHL for some SBNation hockey sites, and nobody watches the AHL so having GIF highlights was useful. The editors of Stanley Cup of Chowder told me about GIF Brewery since I had gotten a MacBook for Christmas that year (2 years ago), and how easy it made making GIFs and was only $5, so I got right to it. Once I learned how, it was really easy to GIF hockey games. I’ve always been a hockey fan in general, so it was never just the Bruins I was interested in GIFing. I became heavily invested in making hockey GIFs during the 2014 Winter Olympics. I made a lot of hockey GIFs from that and that’s when I started getting more recognition. Then during the playoffs, even after the Bruins got eliminated in 2014, I kept going. My main motivator has always been love of hockey. HC: How many games can you watch at once? What’s the average number of GIFs you turn out a week? SV: I have the ability to six games at once, with three screens total – two computer screens and one TV screen. It’s hard to truly watch the games when there are that many on at once, though. I try to multi-task well, but usually I can’t catch the great moments from games when I’m watching more than two or three at once. I take a lot of notes during games of little things I see that might be interesting to go back and look at later when I get a chance, but when there are 10 games on at a time on a busy NHL night, there’s no way I can catch that much beyond just the goals. HC: Are you self-taught? I read where you said you weren’t tech savvy…..but you spit GIFs out so fast. SV: With GIFs I am self-taught pretty much. When I downloaded GIF Brewery, someone explained the basic process to me and then it was just a matter of practice to perfect it. Since I’ve had over 2 years of practice, I can pump out GIFs extremely fast. That’s just 100% practice. When it comes to anything else about computers, I’m not great. HC: What is your other job…the one that pays the bills? Are you still in school? SV: My only current job is working with the Oilers to do their in-game GIFs. I’m actually an undergraduate, I’m still working towards my Bachelor’s Degree. I have an Associate’s Degree but that isn’t much to work with these days. I also just changed my major from History to Communications so I could pursue something with social media, but the finish line for that is pretty far away since I can’t afford to take more than a class or two at once. I still live with my parents, otherwise I wouldn’t be able to get by at all. HC: Any teams or media approach you about employment? SV: The Oilers are the only team that has approached me, and I immediately accepted. I have had a few other offers since last season, but I had committed to SBNation this season so I had to turn down some other stuff. I was going to be all set to do Oilers stuff as well as general NHL stuff, but then SBNation suddenly pulled the plug a few weeks ago and that’s why I have so much free time. HC: Greg Wyshynski and Michael Russo among many in the media, are fans of yours and have both been complimentary. How does that happen? How does that feel? SV: It’s always nice to be complimented, and they have said such nice things about me, it’s humbling. Once Wysh and other popular hockey personalities on twitter recommended me to their followers, I would get a huge influx of new followers, so that gave me a really broad scope of followers from different fanbases, and I think they all found that there was something there for them no matter who they cheered for. I was focused on Bruins games for the 2014-15 season because Boston.com had hired me to do GIF recaps of just the Bruins, and when they didn’t make the playoffs, my time freed up considerably to go back to covering all the teams. It was during the playoffs last season, I think, that I started to get even more mentions from hockey personalities on twitter and beat writers as well, because they found my instant replays in GIF form extremely useful from the press box when they normally can’t see replays of important moments in games. As the season became more intense and the playoffs begun, having those moments readily available was as important as ever, and I think many beat writers and fans who couldn’t watch, or fans that could watch but wanted to share the moments, found the GIFs very helpful, as well as entertaining, so it was becoming a broader service to share and more people in general were engaged in social media while watching playoff games. HC: Do you give yourself permission to take a night off or do you feel obligated to make GIFs if there is a game on? SV: There’s a certain feeling of obligation now that so many people have expressed their gratitude for how I help them follow games. I would take nights off, though, if there was a good reason, but unless it’s the holidays there usually isn’t anything else to do. I don’t have extra money to spend, so I’m home every night anyway, and if there’s hockey on, I’m definitely going to be watching it. It’s weird to watch hockey without GIFing it now, since I’ve been doing so much of it for so long now, and it’s also forced me to pay better attention when I do watch hockey. Otherwise I get easily distracted. I don’t really like any other sports so I just try to enjoy hockey season, because during the summer, I get really bored and miss it a lot. In the course of preparing for the interview, I read coverage of the NFL vs Deadspin and their use of GIFs. The NFL sought to prevent Deadspin from posting footage from games in GIF and sent takedown notices under the Digital Millennium Copyright Act. Of note, Twitter’s terms of service do say users who post infringing content can have their accounts disabled. Deadspin was taken down but restored the same day. Also of note, Twitter recently signed a deal with the NFL to carry highlights of its games, a deal which presumably involves a substantial amount of money. According to Fortune Magazine: Regardless, the company is well within its legal rights to remove accounts or content whenever it wishes — and the NFL and other leagues clearly have a legal interest in pursuing DMCA takedowns as aggressively as possible. However, Copyright law includes a concept known as “fair use,” which entitles anyone to use content without having to get the permission of the rights-holder, and without having to pay a licensing fee. And one of the uses that this principle is designed to protect is the use of content for journalistic purposes. Accounts like @myregularface are watching these developments with great interest. To date, the NHL hasn’t taken a stance on GIF makers but all of that could change when MLBAM takes over in January. For now, do yourself a solid and follow @myregularface for awesome hockey GIFs.